The Synchron 4 Series features a capacious waterfall seat and a large back giving the firm support of a task chair and the comfort of an office chair. It comes standard with a heavy-duty Independent Tilt control that allows for independent adjustments of your seat and back angles. The many options make this chair adaptable for a wide range of applications. For more information view our downloadable brochure here. 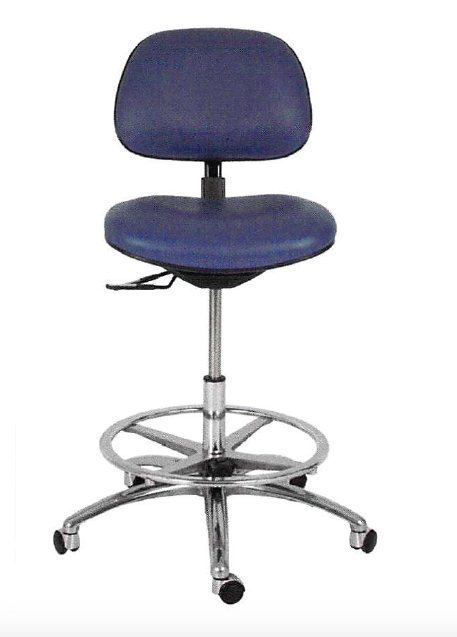 The Stamina 7 Series features a saddle seat for both comfort and stability while performing tasks. It was especially designed to help prevent workers in cleanroom apparel from slipping out of their chairs. In addition, the front of the saddle seat is cut back to allow easier access to the 20” diameter footrest. The Stamina 3 Series offers many ergonomic features and options that make the chairs adaptable to most end users and their required applications. They have become a standard in many Fortune 1000 companies.